One Fat Frog Restaurant Equipment’s Super Mega Warehouse in Orlando is filled to the brim with loads of used equipment you could use to open your own cafe. Cafes never go out of style and are just as much a social environment as they are one for consuming drinks and food. One Fat Frog Restaurant Equipment has everything you need to open a strong, dynamic cafe and stay open long after your grand opening! Here are some of the used cafe equipment you can find at One Fat Frog Restaurant Equipment. Espresso machines, airport/thermal brewers, tea brewers, decanter brewers, grinders, panini grills, refrigerators, freezers, undercounter refrigerators, Vita-mix blenders, frozen drink machines, airpots, coffee decanters, grab and go coolers, and of course restaurant furniture. One Fat Frog Restaurant Equipment is the only dealer in the nation with its own in-house finance manager. This gives One Fat Frog Restaurant Equipment an edge when it comes to getting you financed for your cafe. No matter what shape your credit is in the One Fat Frog Restaurant Equipment finance manager can get you approved! 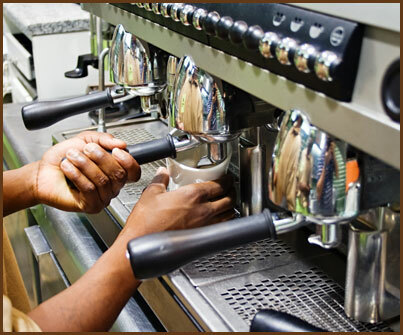 One Fat Frog Restaurant Equipment also welcomes quick cash and package deals for cafe equipment. Come into One Fat Frog Restaurant Equipment today!